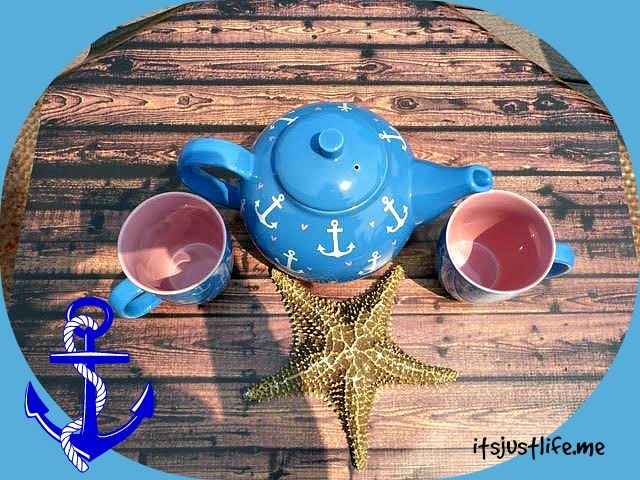 What could be more fitting for me right now than a nautical teapot? Not much, let me tell you. I am getting pretty excited about the upcoming move to a house where out my back door is a lake. I will probably go overboard with the “lake house theme” but for right now I have just fallen in love with this teapot that I found in Lakeside, Ohio when we were there in June. Now I am well aware that there will be no starfish in Lake Atagahi but I couldn’t resist a little bit of staging with one that we got in the Bahamas a few years back. I am really looking forward to my first cup of tea on my back porch using this teapot and these mugs. I think it will be perfect, don’t you? 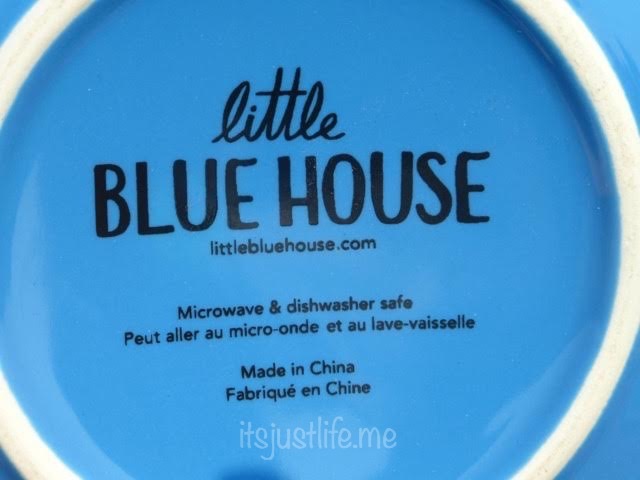 I love the Little Blue House line of products and you bet I will be looking for more from them in the future. But in the meantime, sit back and relax with me as I dream of water views and cool mountain breezes. Another fabulous teapot and perfect for your new house. Good luck with the move. I just returned from a visit to Alberta and am behind on my blog reading. Will catch up soon. No worries! I am sure I am going to be very lax in reading again for awhile but I did at least get most of my favorite blogs put into BlogLovin’ so I am a bit more organized now, hopefully. It is going to be a favorite one in the new place. I think my beach house dream is shifting to a lake house! Oh, are blue and yellow going to be your new colors? Then you can use that blanket from the Faribault Woolen Mill. A star fish here and there is a delightful assessor y to any nautical display. He’s adorable and will fit perfectly in your new home! I know ! I can’t wait to have my first cup of tea with this set on our back porch . This is SO cute, love the anchors and the blue is so beautiful! Thanks so much! I love it as well and know that I am going to use it a lot! I did not know you bought a teapot in Lakeside. This one is very nice and you can think about Lakeside each time you see it. Yep! I got it at the Shade Tree. I saw it when you and I were shopping and went back later and got it. I love it and yes—I will always think of Lakeside when I drink out of it. That is so sweet! You’re going to have so much fun with that nautical theme. What a cutie – right up your alley with the nautical theme. I’m amazed at the pink lining of the cups. Unique. The pink insides surprised me as well! But it is perfect! It is perfect! I’ll bet you’ll be happy when your never ending move ends?! May you have smooth sailing with your decorating! Looks like you are off to a good start. so cute!! I love this one and the matching mugs are so cool. The mugs were a bonus for this one. I can totally see you making that happen some day! Cute set. It will be right at home in your new place. I think so, too! Can’t wait to use it for the first time. 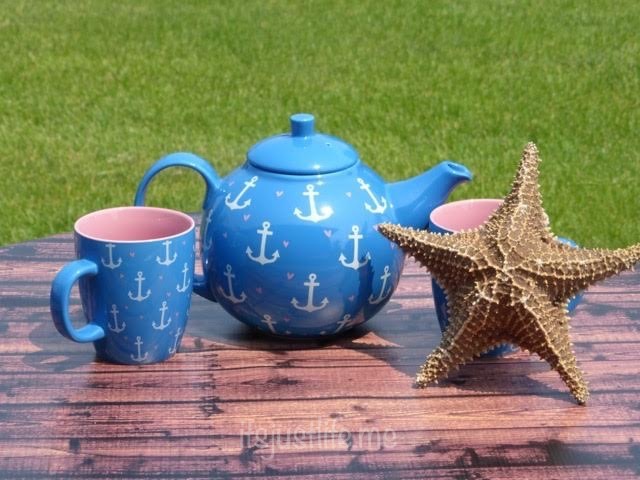 The tea set with anchors looks cute and different. I fell in love with it when I saw it. I love the pink insides of the cups because that was unexpected.